We always encourage attendees to take MARTA to the Atlanta Dogwood Festival, but this year, it’s more important than ever! See below for shuttle information, and give your MARTA Breeze Card a workout! The Atlanta Police Department will be heavily enforcing all illegal parking around Piedmont Park the weekend of the Atlanta Dogwood Festival. Residential Parking fines have substantially increased and vehicles parked within tow zones will be impounded. 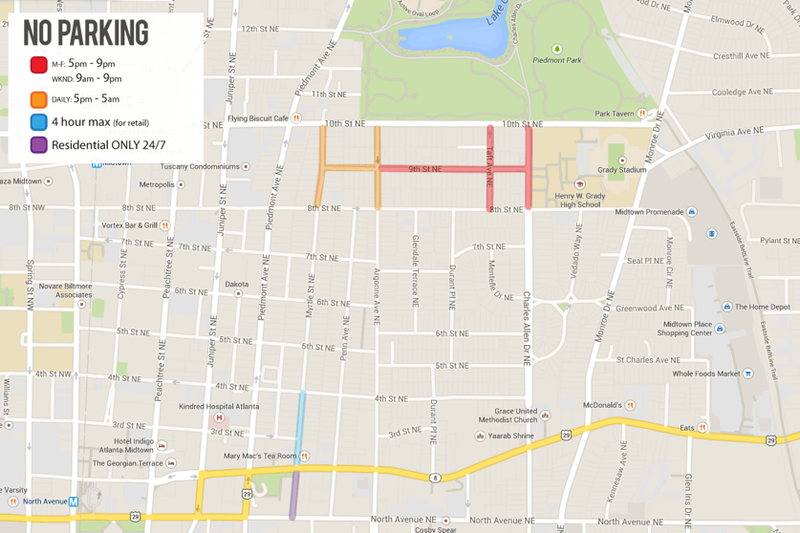 We encourage everyone to utilize MARTA or park in authorized parking lots in the area. SpotHero.com can assist with the parking. Look for the free “school bus” shuttle to bring you from MARTA to the festival! A bus with wheelchair access will operate from Midtown MARTA and will drop off along Piedmont between 13th and 14th Streets. Shuttle buses will drop you off at the curb cut out between 13th and 14th Streets at Piedmont Avenue- that’s where you can also pick up a bus back to MARTA after your festival visit. Click here for directions to the Atlanta Dogwood Festival on MARTA. Ride Your Bike to the Festival! We’ll have a bike valet available for attendees coming to the festival on bicycles. Find it on 10th Street near Charles Allen Drive in the bike lane. Due to a city ordinance, no dogs (other than service dogs and the pre-registered competing dogs) will be allowed in Piedmont Park during the festival. No Smoking in the Park! There is a City of Atlanta ban on smoking in outdoor parks and recreational facilities including Piedmont Park where the Atlanta Dogwood Festival is located. This means no tobacco products including cigarettes, cigars and pipe tobacco will be permitted.